Just Aesthetics is a dental and aesthetics center based in the heart of Jumeirah Beach Road. Their services include clinical and aesthetic industry as well as skin dermatology. 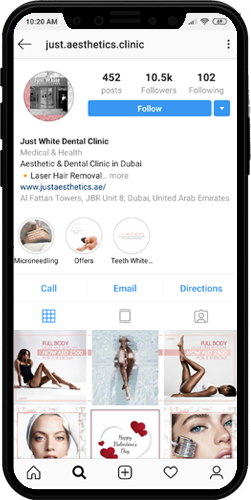 With Tahawal, Just Aesthetics’ social media is now more aligned with their brand with beautiful and aesthetic posts that are aligned to their business, brand and quality of service.